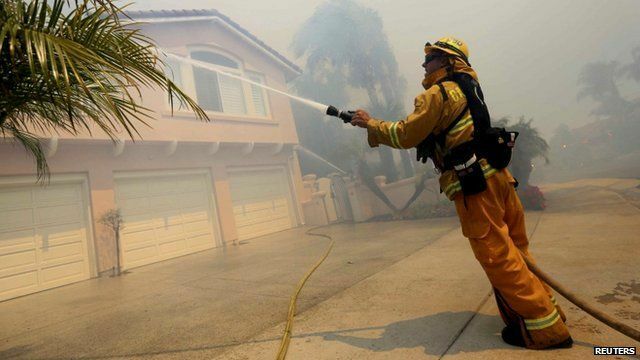 Thousands flee California wildfire Jump to media player Thousands of people have fled their homes in southern California to avoid an aggressive wildfire that's destroyed several houses so far in the city of Carlsbad, near San Diego. Thousands flee San Diego wildfire Jump to media player More than 20,000 homes have been evacuated in the suburbs of San Diego, after strong winds fuelled a nearby wildfire. Thousands of people have fled their homes in southern California to avoid an aggressive wildfire that's destroyed several houses so far in the city of Carlsbad, near San Diego. Firefighters are struggling to contain the fires in hot, dry and windy conditions. David Willis reports from Los Angeles.